Our Motor Rewinding is rendered in almost all industrial and commercial sectors. The motors are the workhorse of any industry, and thus need regular maintenance and prompt repair. We have appointed highly experienced professionals in our team who stringently test the induction motor on various parameters after repairing so that it delivers high end performance. 2. Team of experienced engineers backed by design input and Re-Engg skill. 3. Use of quality material of reputed make. 4. State of Art Technology for accuracy. Our company holds vast experience in this domain and is involved in providing Rewinding and Overhauling of AC Motors (LT& HT). 1. 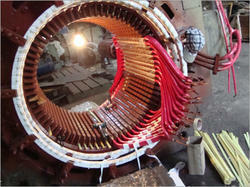 Rewinding of Electric AC Motors of Rating 1000 HP and ABOVE. 2. Overhauling of Electric AC Motors of Rating 1000 HP and ABOVE. Selection of concentric and equal-size aluminium arbors. Five different concentric and six different equal-size arbors. We are a recognized name in manufacturing arbors which perfectly with the highest quality standard.Our arbors are long lasting and consume less time in setting up and operating. We hold expertise in offering high-grade quality services to our clients like Rewinding of AC/DC Motors. Our organization has hired expert professionals, who helps us in rendering these services. In addition, we offer services that helps in maintaining H.T. / L.T. Motors on Site. These services are highly acclaimed in the industry for their reliability, timely execution and flexibility. - SVM's electrical department is able to handle most size electrical motors, from repair to supply. We are directly dealing with distributors. Thereby, allowing our clients to receive the best possible price for one of the best electrical motors. - Fast Repair & Service. - Alfanar Technical Services (ATS), is a specialised business unit of alfanar and is one of its kind facility for reengineering services for Motors, Transformers and Generators.